How much for that pretty kitty in the window? 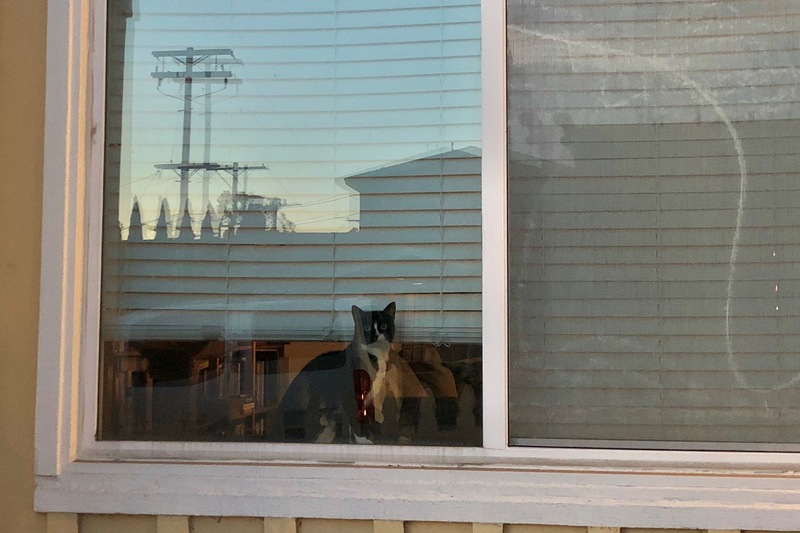 About 30 minutes after sunset today, my wife and I went out for a spontaneous late-afternoon walk, where she spotted this tip-top Tuxedo looking out, along Meade Ave. between Alabama and Florida. The series features nine kitties sitting inside windows, staring out: Cool, Curious, Glass, Kit, Seeker, Star, Still, Twain, and Watcher. Another, Burglar, climbs into one. I did not bring Leica Q, unfortunately; iPhone X struggled in the descending dusk, getting some benefit from the sunset’s lingering glow cast against the glass. Vitals, for the Featured Image: f/1.8, ISO 100, 1/4 sec, 4mm; 5:17 p.m. PST. However, I contend that the EXIF is wrong. I tapped the 2X icon for the f/2.4 second lens, and this portrait, and another, absolutely are zoomed compared to the first, which I am certain was f/1.8. Sigh. the photo is noisy, which is most evident at full view; Leica capture wouldn’t have been. The most important question: What to call this fine feline, whose real name is unknown? Charm is my choice for the lovely furball, whose portrait underwent a fair bit of post-production tweaking to make more prominent the eyes, and right half of the face. You shouldn’t miss: Scruffy, Roly Poly, Woo, Skull, Biscuit, The Colonel, White, Chipper, Frisky, Stretch, Needy, Farfisa, Mates, Hunter, Pee-Pee, Blue, Blue Too, Bonded Pair, Patience, Fess, Jumper, Frenemy, Looker, Cozy, Scout, Lurks, Skit, Mini, Betty, Black and White, Stalker, Bell, Chill, Sammy, Scratch, Poser, Star, Grey and White, Watcher, Herman, Comet, Roman, Willow, Chub, Nimbus, Watson, Lilo, Kit, Pepe, Twilight, Sebastian, Spot, Booger, Ash, Veruca, Riley, Mellow, Bonde, Flower, Glass, Black, BeBe, Fang, Bruce, Siamese, Pounce, Tortie, Haiku, Fraidy, Peso, Daniel Tiger, Dusk, Stride, Dainty, Spry, Tabby, Betty Too, Still, Levi, Shadow, Sophie, Wink, Ferals, Momma, Charlie, Tux, Cool, Benny, Jellicle, Itchy Valentino, Goldie, Nine, Amanda, Siesta, ChaCho, Charlie, Too, Mika, Crystal, Seeker, Mittens, Dancer, Smokey, Monkey, Captain Blackbeard, Season, Maven, Tink, Chunk, Curious, Hanoi, Bella, Tarry, Guido, Maxine, Mr. Kitty, Peohe, Panda, Frankie, Sunshine, Twain, Willow, Too, Brawn, Reddy, Burglar, Laramie, Lupe, Bright, and Tom.